The Church of St. Mary the Virgin stands at the top of Church Hill, Caterham, Surrey. It is an impressive Victorian Gothic building, and was built to replace the ancient Church of St. Lawrence as the Parish Church for Caterham. St. Lawrence’s Church (1095) was not demolished: it stands on the opposite side of Church Hill and is still used for various acts of worship. The present Church is surrounded by a closed Churchyard, on three sides, with parking and the St. Paul’s Centre (1990) on the north side. On the south side is the (attached) church hall (built in the 1960s) which has recently undergone major refurbishment. St. Mary’s was consecrated on 7th May 1866 by the then Bishop of Winchester. It was designed by W & C H Basset Smith in the “Decorative” style but has been enlarged since then. 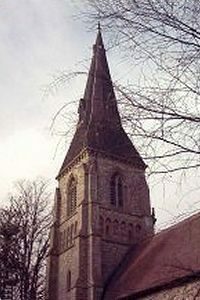 In 1883 the Church, with a nave, chancel and narrow side aisles, was extended by the addition of a new south aisle, Tower and Spire (126ft). In 1891 a carillon of 8 tubular bells was added, and at a later date the chancel was extended and the Lady Chapel built. In 1908 the organ was installed. In 1912 the North Aisle was added. 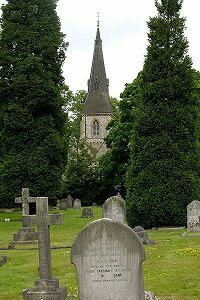 The main benefactor of the church was Harry Lloyd, (son of the great publisher and newspaper proprietor Edward Lloyd) who lived at “The Woodlands”, Caterham. He provided free seating for villagers and stipulated that the North Windows (1912) should not contain any stained glass. However, the church has several stained glass windows, located in the chancel, the chapel and the West wall. The Rev. 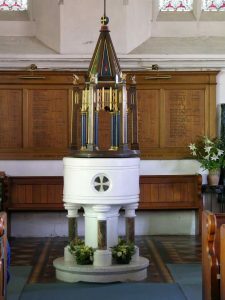 Dr. George Butterworth (Rector 1937-51) had the interior walls of the church whitened and the font moved to its present position at the west end of the Nave: an elaborate font cover was also installed, with a balanced lifting assembly. The Church has brick walls, externally rendered with flint and dressed stone around the windows, doors and external angles. The Spire is constructed of heavy pitch pine timbers and covered with cedar shingles. The Church nave of four bays is crammed with pews providing seating for around 420 people. 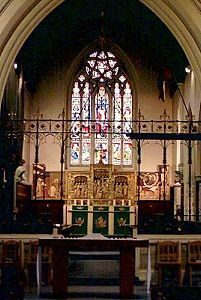 There is a hand-wrought screen across the Chancel, and between the Sacrament Chapel and the Choir, with a smaller screen at the entrance to the Chapel. In 1994 a peal of 8 bells was installed in the Tower. In 1998 a new Nave Altar platform was built in front of the chancel screen, to aid modern worship. In 2009 there was a need for a new entrance to cater for disabled access, and the North Door entrance was refurbished with two pairs of internal glass doors, new wooden external doors, steps and a ramp. The North Door is now the main entrance, and has a much more welcoming look than the West Door under the tower. Information on the occupancy of the graves in the churchyard can be found here. Memorials in both St. Mary’s and St. Lawrence’s churchyards are listed in the Book of Remembrance. These include buried Urns of Ashes, plaques, trees and benches. In November 2014, the Memorial for the St. Lawrence’s Hospital Staff lost in the wars was installed on the west wall of the south aisle.